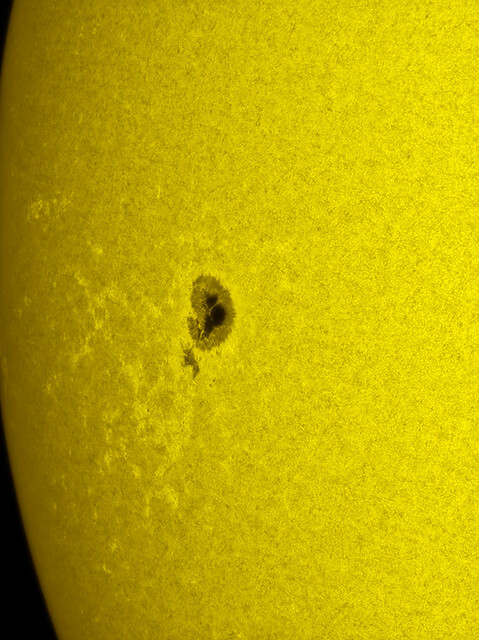 A large sunspot, AR11711, came around the eastern limb on April 1, 2013 (north is up in this image). I captured it in white light today through my WO 132mm f/7 refractor, Baader Herschel Wedge, and Point Grey Grasshopper USB 3.0 camera. I used a 2.5x Powermate for this shot and stacked approximately 250 frames with AutoStakke 2.0 and processed in PS CS6. Image taken from Redshift Observatory near Mayhill, New Mexico. Equipment category A.